These two midstream partnerships are at opposite ends of the yield spectrum. Which stock is right for your portfolio? Investing in midstream master limited partnerships is generally all about the distributions, which the tax-efficient corporate structure is designed to provide to unitholders. However, that doesn't always mean a high distribution yield is the goal, which is the key to determining if Holly Energy Partners, LP (NYSE:HEP) or Phillips 66 Partners LP (NYSE:PSXP) is the better buy. Here's what you need to know to make an informed decision between these stocks. Phillips 66 Partners was created by parent and general partner Phillips 66 in 2013. It was, essentially, a way for refiner Phillips 66 to generate growth capital while still maintaining control of its pipeline and logistics assets. It achieved this by selling (or dropping down, in industry lingo) pipelines and other businesses to Phillips 66 Partners, a company it effectively runs via its general partner interest. Phillips 66 also owns a significant number of limited partner units in Phillips 66 Partners. 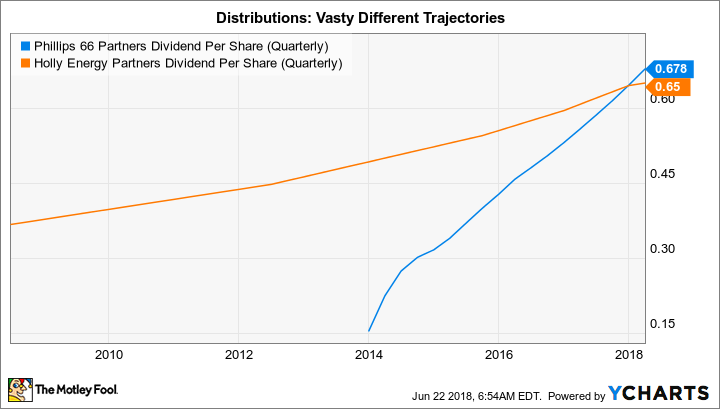 The benefit for unitholders of Phillips 66 Partners is that they receive distributions from the largely fee-based revenue associated with the midstream assets it has bought from its parent. And as a partnership grows, those distributions generally head higher. That's a net benefit for Phillips 66 as well, since it gets incentive payments for increasing Phillips 66 Partners' distribution over time. Although many midstream partnerships have chosen to eliminate these incentives because they raise the cost of capital, at this early point in Phillips 66 Partners' life cycle, it appears that unitholders and the general partner are still well-aligned. The first five years or so of Phillips 66 Partners' existence have been pretty exciting for income investors. The general partner dropped down a steady stream of assets, helping to push the distribution higher by 31% on an annualized basis since the initial public offering. Although that comes off of a small base, it's still a pretty incredible figure. That level of distribution growth isn't likely to continue as Phillips 66 Partners starts to switch to a new phase of growth driven more by internal development than dropdowns. However, Phillips 66 Partners CFO Kevin Mitchell made clear during the first-quarter conference call that parent Phillips 66 was ready to step in with more dropdowns if organic growth projections don't live up to expectations. In other words, I would expect distribution growth to slow from the heady 30% rate, but to still be fairly robust. The second-quarter distribution, for example, was 20% higher than the distribution paid a year ago. Phillips 66 Partners' current round of internal growth projects. Image source: Phillips 66 Partners LP. In short, Phillips 66 Partners is really a story about distribution growth, which is why the yield is a relatively modest 5.5% today. While that's just middle of the pack in the midstream limited partnership space, it's actually relatively high for the partnership. Investors appear concerned that the transition to a new phase of growth comes with increased risk -- even though parent Phillips 66 appears ready to backstop the company if needed. Holly Energy Partners, with a yield of around 8.8%, is in a different position. It, too, was created to buy assets from its general partner, refiner HollyFrontier. However, HollyFrontier has pretty much sold all of the assets it had to sell to the partnership. The only option for Holly Energy Partners now is ground-up construction and acquisitions. That means the future is much less certain, since its general partner can't step with new assets to sell if growth spending doesn't pan out as expected. In fact, Holly Energy Partners recently bought back HollyFrontier's incentive distribution rights to help reduce its cost of capital. That required issuing the general partner 37.25 million new units, but was expected to reduce the company's cost of equity capital by as much as 30%. That should make acquisitions a lot easier to finance. To be fair, Holly Energy has done an admirable job over time of growing and rewarding investors along the way. It appears to be making the right moves to keep expanding its portfolio and deserves the benefit of the doubt here as it, too, has switched to a new phase of its life cycle. All of that said, over the past decade Holly Energy Partners' distribution growth has been in the mid-to-high single digits. That's a lot slower than what investors have been rewarded with at Phillips 66 Partners. And with Holly Energy Partners' future a little less certain than it was before, it's reasonable that investors would demand a higher distribution yield. The story here, then, is a high yield and relatively slow growth. Holly Energy Partners is also a little bit more aggressive than Phillips 66 Partners when it comes to distribution coverage. The big unit sale has depressed Holly Energy Partners' distribution coverage, which it is currently targeting at between 1 and 1.2 times (it fell to 1.04 times in the first quarter and could go below 1 in the second quarter based on seasonal factors). In short, this year is going to be tight on the distribution front for Holly Energy. Phillips 66 Partners, by comparison, has never allowed its distribution coverage to dip below 1.1 times. Moreover, it was 1.4 times in the first quarter, leaving ample room for further hikes. This is another solid reason why investors are demanding a higher yield from Holly Energy Partners. At the end of the day, both Holly Energy Partners and Phillips 66 Partners are attractive partnerships. However, they are at different stages of their business lives. While Holly Energy will provide investors with a high level of current income, its future is far less certain than Phillips 66 Partners. A big part of that is Phillips 66 Partners' supportive parent, but you shouldn't forget its robust distribution coverage, either. While both partnerships are moving into a new life stage, Phillips 66 Partners is likely to be the more rewarding investment over the next few years.